It is ironic that Gina Rinehart's ''epistle to the Australian people'' should coincide with a report confirming children who lived in Wittenoom, Western Australia, between 1943 and 1966 are dying of asbestos-related cancers at a rate well above the national average (''Deadly asbestos mine takes toll for Wittenoom kids'', smh.com.au, September 4). As Wittenoom asbestos mining was the foundation of the fortune of her father, Lang Hancock, perhaps Rinehart may now like to apply her wisdom and wealth to the problem of these unfortunates. MY MOTHER, Stella Heinrich, was inspired and aspirational. An award winning hotel cook, she made enough extra money from selling her water-colour landscapes to send my brother Les and myself to good schools. She believed that with a good education we could raise ourselves above the hard work and long hours that it took her to provide for our needs. Stella Heinrich took jobs in remote areas of WA; in part, because enterprises in those places paid more ― but also, in many cases, because she wanted to paint the landscapes of the area. The spectacular landscape was a significant factor when, in the late 1950s, Stella took a job at the staff mess in Wittenoom Gorge for Australian Blue Asbestos (ABA), at that time a fully owned subsidiary of CSR. It was a well-paid position and, as a bonus, she was encouraged to have her children come and stay with her. The company was also happy to employ my brother Les as soon as he was legally able to work. So, at 15, he had a school holiday job working in the asbestos mill. Financially, we were better off than we had ever been. Les went on to achieve seven distinctions and two exhibitions for his Leaving Certificate, acquired a degree and ran a successful consultancy ― until he died a few years ago from mesothelioma. Thousands of families whose relatives die because of exposure to asbestos will be left with little or no compensation under a new law to be announced this week. Legislation that forces the insurance industry to pay victims whose employers' policies can't be found will be announced in the Queen's Speech on Wednesday. But it has been so watered down after lobbying from insurers that it will help only a fraction of the victims, and payouts will be 30 per cent lower than is standard for the asbestos cancer mesothelioma. The Independent on Sunday has campaigned since 2009 for a victims' fund paid for by insurers, but the deal that has been struck is significantly poorer than was first proposed. A victims' group said yesterday the Mesothelioma Bill was an "insult" to the thousands who had paid for employers' negligence with their lives. When the Labour government first put forward the scheme in 2010, it was meant to apply to all those with fatal asbestos-related conditions who could not trace an insurer. The new scheme will apply only to people with mesothelioma, who make up about half the cases. Those with other lung cancers or conditions caused by asbestos will get nothing if they cannot trace an insurer. With the Government under fire over asbestos safety concerns concerning the NBN, it should be remembered that the Coalition’s hands are hardly clean when it comes to this deadly industry. With 60,000 people likely to die by 2030 from mining asbestos at Wittenoom, Ludwig Heinrich says many people should be tried for murder and their assets taken as proceeds of crime. Prime Minister Julia Gillard has taken a swipe at Tony Abbott for trying to politicise the discovery of asbestos in communications pits being used to roll out Labor's national broadband network (NBN). The opposition leader asked Ms Gillard in parliamentary question time whether the $50 million the government has committed to advertising the NBN would have been better spent insuring communities were protected from exposure to asbestos resulting from the NBN rollout. "I am a little bit surprised that he would choose to play politics with this, because as he well knows this is a matter involving the pits and ducts ... the responsibility of Telstra," Ms Gillard told parliament on Monday. "I suppose we should not really be surprised given that this is the same person who insulted Bernie Banton on his death bed." Mr Banton, an asbestos campaigner, died from asbestos-induced fibrosis. Employment and Workplace Relations Minister Bill Shorten said Telstra had accepted in a meeting with a range of stakeholders on Monday there had been deficiencies in the management of asbestos. "Telstra made it very clear at this meeting that they accepted that they have to do more," Mr Shorten told parliament. "Telstra accepted in matters going from inspections, to training, to education, that there had been deficiencies and that they needed to do more." He said he had written to Telstra in 2009 to say people were reporting problems with pits. "And Telstra wrote back and said they had the matter under control. "Then we have seen in recent days and weeks ... clearly they haven't." Mr Shorten said the identification and eradication of asbestos in Australia was a priority for this government. He said people should be pleased that Telstra was being open and transparent about the problem. The present asbestos "scare" in the Telstra pits is more a plot do damage the NBN than a proper safety issue. One has to place a proper outlook on this and as Telstra employee Union said this morning they are satisfied by the company's response to the problem. But this does not stop the merde-och press to bash Oakeshott for saying the "scare" is out of proportion. In the merde-och press there are columns after columns about this PROBLEM but nothing about global warming — a much BIGGER problem than a few telephone pits with asbestos (mixed in cement and other medium). Many of my old friends and myself "have played" with asbestos for years since we were kids... None have been affected with asbestos related disease. I do not want to discount the problem encountered by people who have contracted the nasty mesothelioma from working with asbestos. But a single whiff is rarely enough, like with smoking ‚ it takes years of product inhalation to do damage — though some people are more susceptible than others. A public health expert has downplayed fears that work on telecommunication pits could lead to harmful asbestos exposure among nearby residents. Several sites in New South Wales, Victoria and Western Australia have been shut down because asbestos was disturbed during excavation works for the roll out of the National Broadband Network (NBN). Authorities are investigating safety breaches and some concerned residents in the Sydney suburb of Penrith evacuated their homes. But Professor Bruce Armstrong, who has been researching asbestos-related diseases for decades, says there is next to no danger for residents near the affected sites. 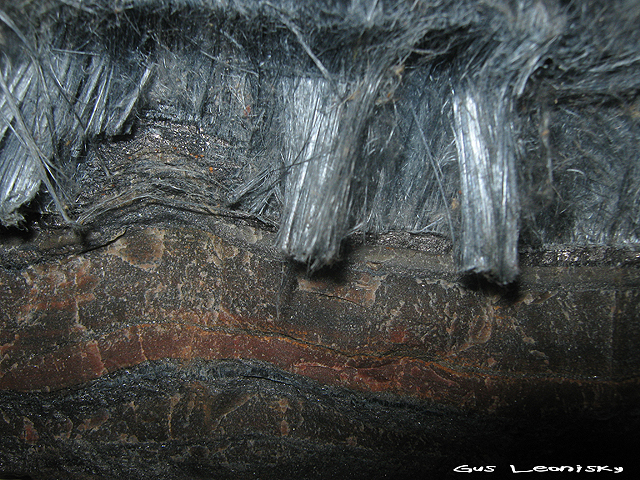 He says asbestos fibres are less dangerous when they are bound up in concrete sheeting. Landowners who refuse to move from the most contaminated site in the southern hemisphere will have their properties compulsorily acquired by the Western Australian government. A bill to finalise the closure of the former asbestos mining town Wittenoom in the Pilbara, which was de-gazetted in 2007, was due to be introduced to state parliament on Wednesday. Five landowners, three of whom still live in the former town site, will be paid generous compensation packages that will cost the state government $2m-$3m in total, lands minister Ben Wyatt said. Wyatt said many of the 17 freehold properties that remained were bought “effectively for $1 given the nature of the value of them”.